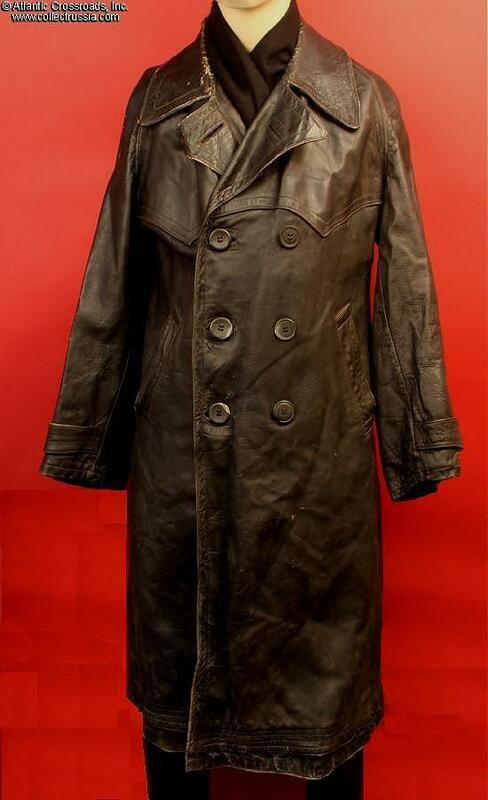 Soviet Air Force pilot's leather coat, circa 1930s / WW2. 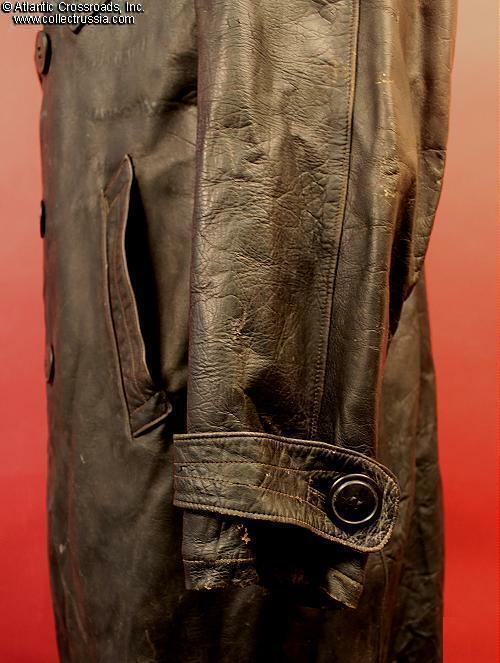 Soviet Air Force pilot's leather coat, circa 1930s / WW2. 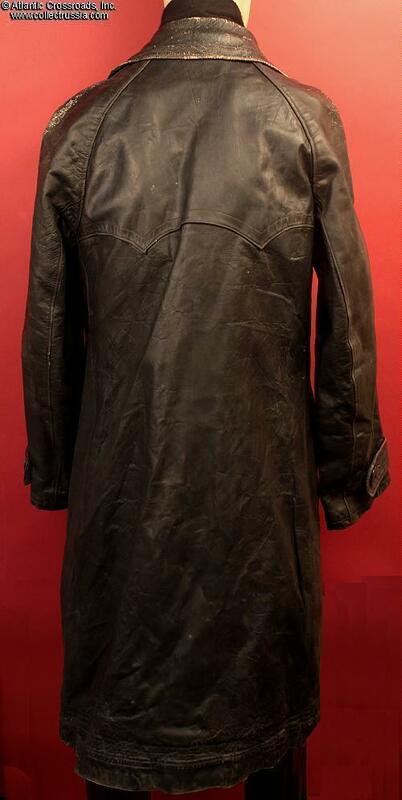 Black leather, full length, with a sturdy cotton liner. Medium size, approximately US size 38. 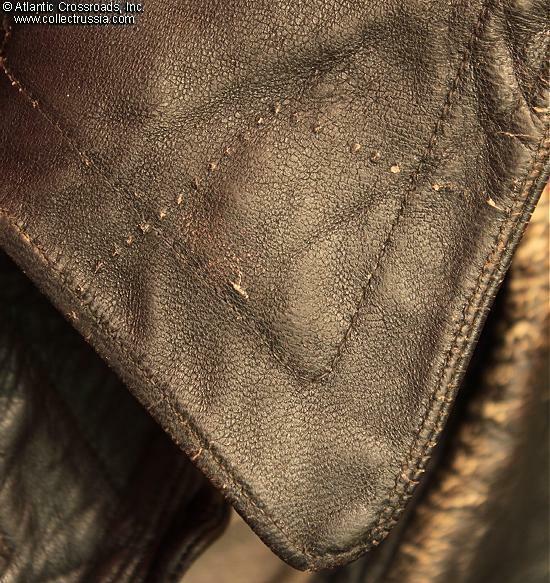 While the stitch marks from where cloth rank tabs were once sewn to the collar points are virtually impossible to see from the top, from the underside the stitching is very clear and shown in our photographs. Large buttons show wear and appear to be original to the coat; only two are missing and they were both at the very top, close to the collar where the top flap would fasten over - their absence does not detract. 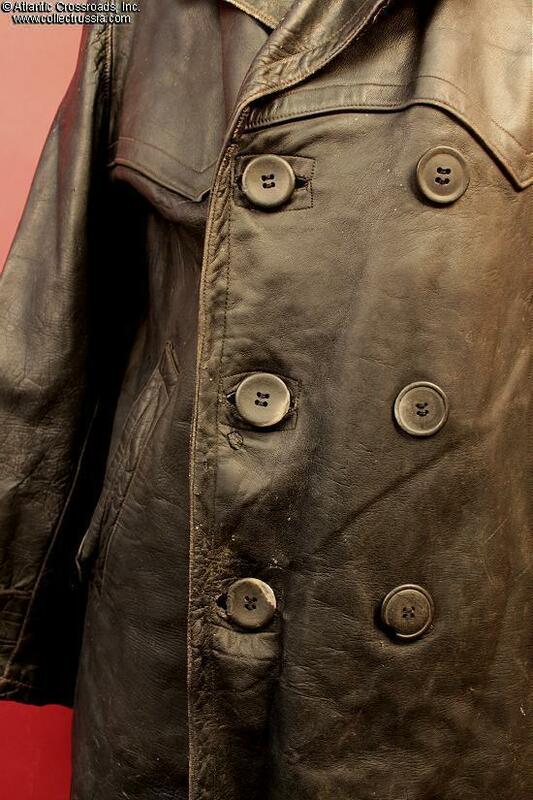 It appears that at least three of the buttons were moved at some point to improve the coat's fit for the owner. 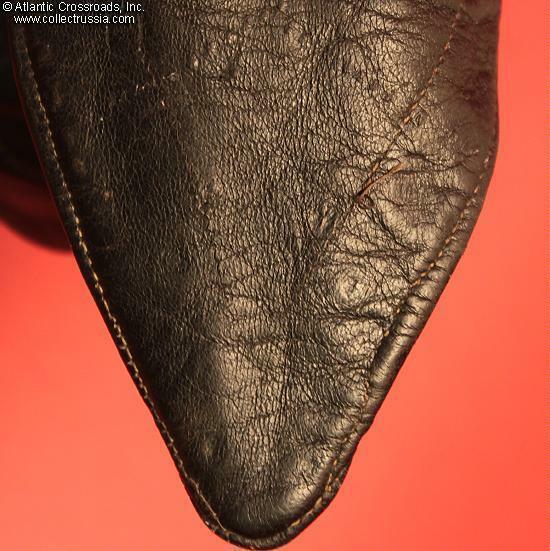 There is no clear indication that the coat had external belt loops - if it once had a leather belt, the loops were removed a very long time ago. Condition is very good to excellent. Moderate, even wear overall. 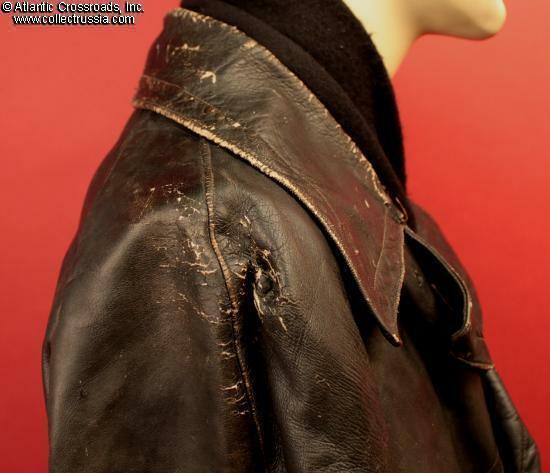 Black finish is 95% except at the collar where it received the greatest wear, almost all of the leather is pliable and the leather has a soft, overall gloss. Minimal scuffing and wear with some scratches but no external holes or repairs. Wear to collar area is detailed in the photos. The gray cotton liner shows moderate use and one small hole. Aside from normal wear, the liner is complete and intact and holding together well. No markings or labels, but definitely a correct 1930s / wartime configuration. 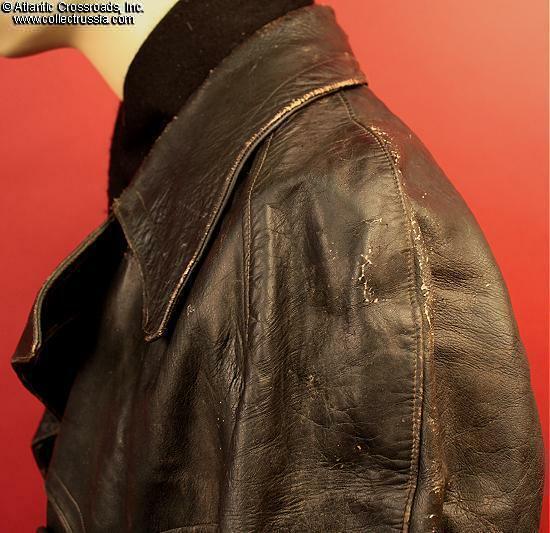 Jacket is overall solid and is a prime example of a coat once worn by a hard working WW2 Soviet pilot. 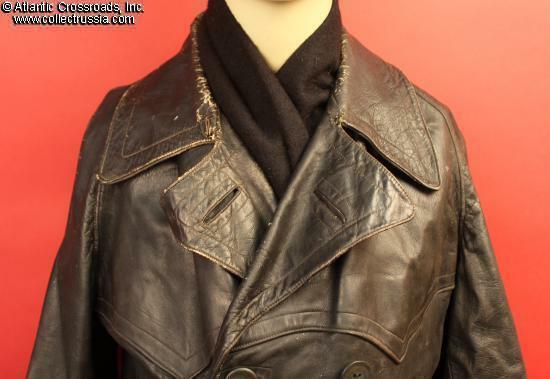 This piece would make an excellent basis for a complete WW2 Soviet pilot uniform - it would definitely provide the "finishing touch" if it was dramatically draped over the shoulders of a pilot's uniform on a manikin. Please note: the scarf and boots are not included. A study of Russian WW2 pilot photos will show numerous examples of this type of coat in use in nearly all weather conditions. Unlike all the other major air forces of the Second World War, Soviet air crew apparently had no general issue flight jackets. 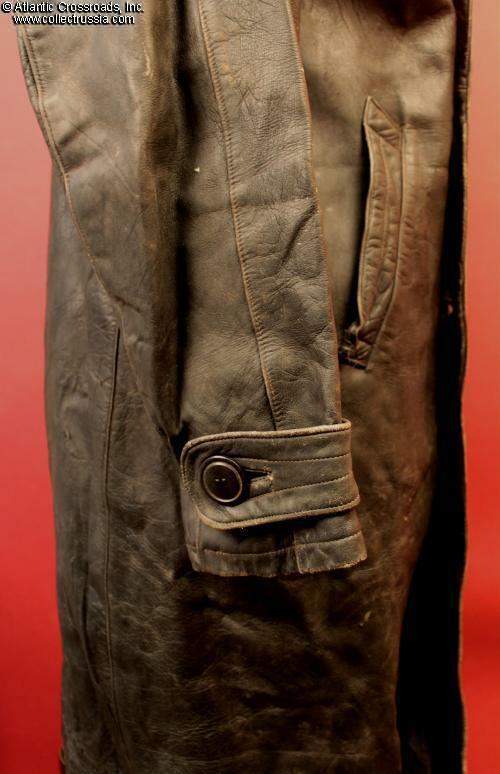 While Russia did receive Irwin fleece flight jackets from Great Britain, this long black leather coat was closest the Soviet uniform industry came to issuing a leather "flight jacket" until very late in the war. Very scarce example of Soviet flight clothing.